Grand Complications were seen at Audemars Piguet and A. Lange & Söhne. The white gold and titanium Audemars Piguet Tradition Tourbillon Minute Repeater is an almost retro-looking ten-piece whose impact was blunted a bit by the firm’s new Grand Complication, an extremely limited edition in the Royal Oak Offshore family that features a split-seconds chronograph, minute repeater, tourbillon and a perpetual calendar—all packed into a 44 mm titanium case. At A. Lange & Söhne, where the news of a Grand Complication was essentially broadcast via the very oversized clock-sized version of it greeting all who pass by the booth, visitors learned that the Glashutte-based brand’s Grand Complication will feature a chiming mechanism with grand and small strike, minute repeater, split-seconds chronograph with minute counter and flying seconds as well as a perpetual calendar with moon phase display. Other very complex models were seen at Jaeger-LeCoultre, which introduced the Master Grande Tradition Gyrotourbillon III featuring instantaneous digital chronograph and a flying tourbillon with a spherical hairspring. In addition, the firm introduced a terrific Master Grande Tradition Tourbillon Cylindrique Quantieme Perpetuel, a platinum-cased perpetual calendar that is one of three Jubilee models celebrating JLC’s 180th anniversary. 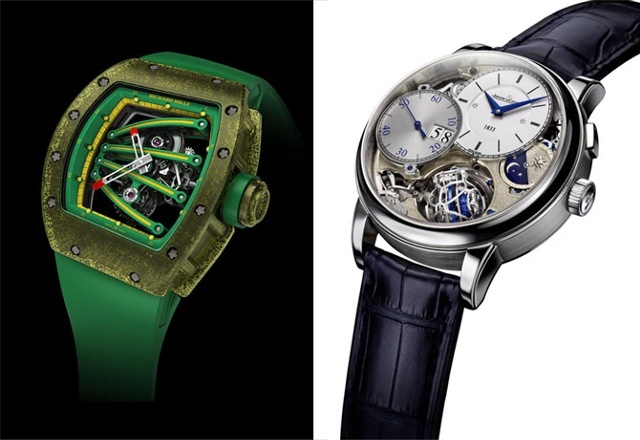 Richard Mille continues to wow collectors with his blend of high-tech tourbillons constructed from materials that are typically found in fighter jets or racecars. 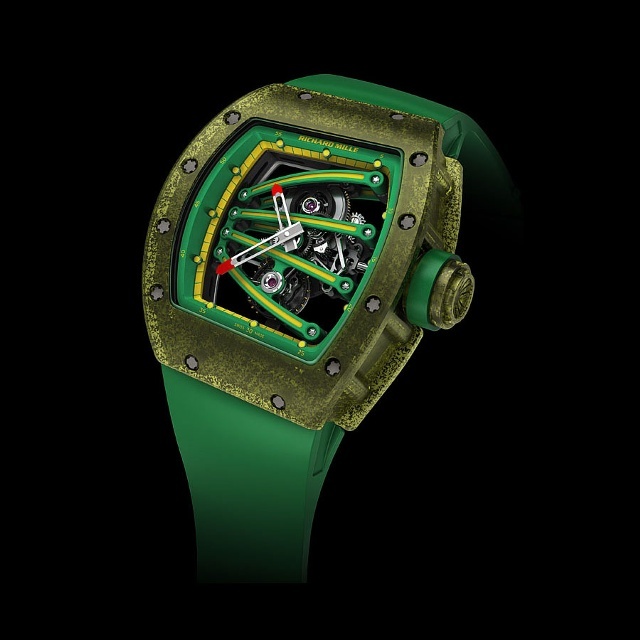 His RM059 Johan Blake edition (named for the Jamaican sprinter) for example is a mix of carbon nanotubes forged into splayed green and yellow bridges created from a mix of aluminum, magnesium and silicon. 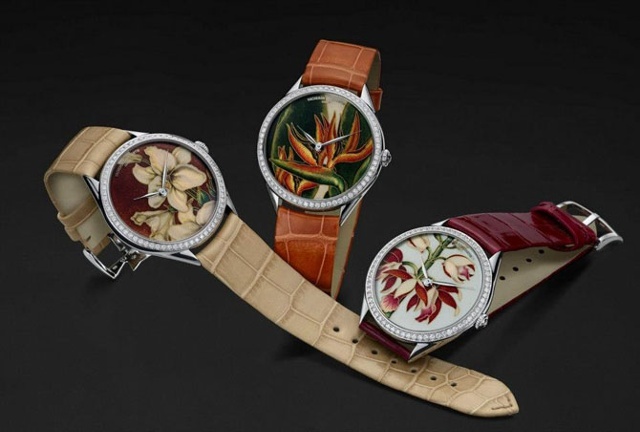 Dials were Vacheron Constantin’s focus as the Geneva brand’s all-ladies debuts featured Métiers d’Art Florilège, a trio of beautiful artistically crafted dials featuring special flowers. This trilogy pays tribute to English botanical illustration in the 19th century and includes a limited series of 20 collector’s watches with the bezel set with round-cut diamonds and five more with the bezel set with baguette-cut diamonds for the Vacheron Constantin Boutiques. Stay tuned to iW for continued reports about new models from SIHH 2013.